Highbury Town often began games badly, passes going astray when poor communication led to misunderstandings on the pitch. Fortunately, the team would rally late in matches, combining effectively to leave fans happy at the final outcome. Nowhere was this better illustrated than with the front two of Frank Churchill and Jane Fairfax. Having spent the first 85 minutes seemingly avoiding each other, they would eventually develop an effective pairing just before the final whistle. Churchill, of course, only had himself to blame for any tactical errors, since he was notorious for arriving late (or not at all) to squad meetings. Mr Knightley and Miss Woodhouse (“Emma”) formed a strong core. They often took up alternating positions before building a more settled partnership late in the second half. Miss Bates’ selection in midfield was controversial, many believing she was only there to appease the critical Highbury crowd. Journalists regularly complained about her post-match interviews where she would spend several minutes answering a simple question without ever revealing anything of interest. The real character in the team was the goalkeeper, Mr Woodhouse, who famously refused to leave his penalty area and once walked off in the middle of a game because of light snow. His fitness was always a concern, as evidenced by the many weeks spent in the care of Mr Perry, the chief physio. At the back, neither fans nor teammates warmed to Mr and Mrs Elton. The constant use of their elbows did make them uncomfortable opponents for visiting strikers. However, their regular wish to take up a position alongside Knightley often disrupted performances and was symptomatic of the team’s internal disarray. As one insider noted at the time, “One half of the squad cannot understand the pleasures of the other.” Mrs Elton’s open desire to be captain also did little for the team’s cohesion. Player-manager Emma Woodhouse kept the captaincy, though, despite her known involvement with match fixing. Mr Martin and William Larkins took on the hard work on the flanks. Early in his career, Martin failed to reach the levels of performance expected by his manager, but later formed a very effective partnership with the attractive No.10, Harriet Smith. 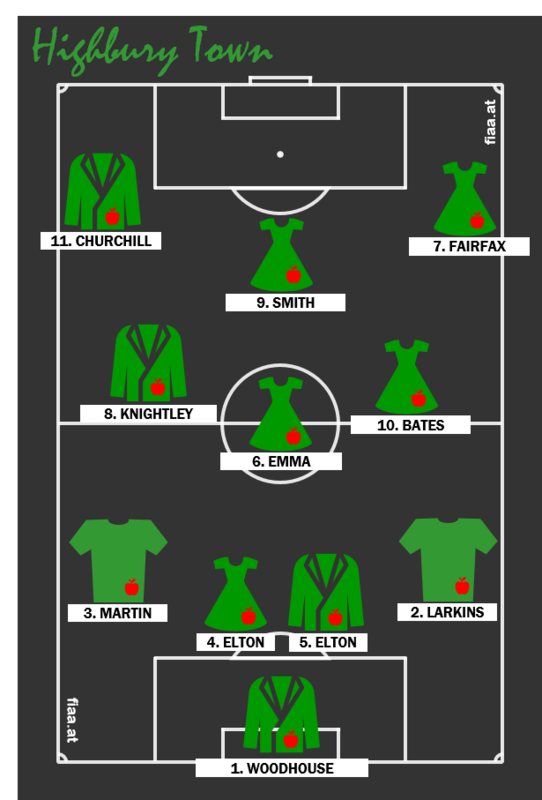 Miss Woodhouse initially favoured a more prominent role for Miss Smith alongside Mr Elton; his rejection of this tactical change was just another example of the divisions that held back the team. Like Persuasion, Highbury Town suffered from comparison with their literary neighbours in Hertfordshire and Derbyshire. Mr Knightley, for example, never gained the same level of adulation as Pemberley’s midfield superstar, Fitzwilliam Darcy, known to his many fans as FD7.